Need help printing your worksheet? I've had a few people e-mail me about having problems with downloading and printing out worksheets. Most of the time it's just as simple as not seeing the printer icon or download arrow. I thought I'd put together a little walkthrough to show you where these icons are so you can print out your worksheets without having to wait for me to get back to you. Occasionally, there may be a problem on my end. All of the worksheets are hosted on Google and free to download without needing a Google account. At times, I've forgotten to set the sharing settings to open/public. If that's the case then please contact me and I'll fix it. Whenever you click on a worksheet, it will open up the PDF file in a new tab. At the top of the screen is the bar that you'll use to print/download your sheet. This bar disappears after a few seconds. Move your mouse and it will appear again. On the left of the bar is the file name. On the right side is your Google info if you're logged in or a 'Sign In' prompt if you aren't logged in or don't have an account. What matters to you is what's in the middle. The middle of the bar changes slightly depending on whether you are logged in or not. The main difference being that you can open the PDF with third-party apps and share the worksheet in your circles if you have a Google account. To print your document click on the the printer icon (the 1st one in the photo on the right). To download, click on the arrow. Clicking the printer icon will open up your printer in a new window. You may get a pop-up blocker warning. 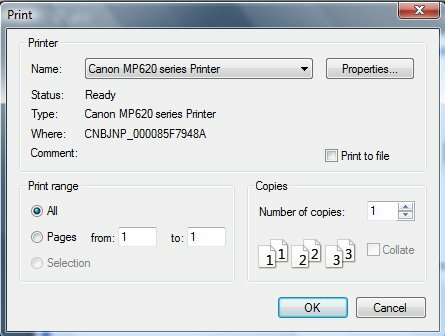 Press "Allow" to continue then OK to print. If you clicked the download arrow, the above box should open in a new window. If not you need to disable your pop-up blocker again. 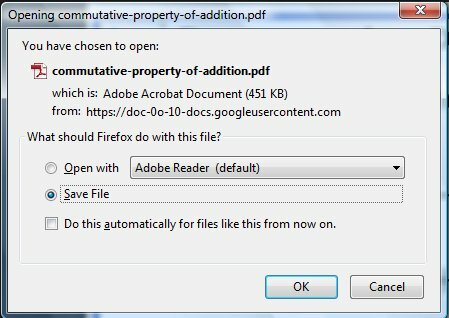 Click 'Save File' then 'OK' to save it to your computer. If you are still having problems, contact me.